I recently accompanied Rohit Naniwadekar and Monali Mhaskar from the Nature Conservation Foundation on a survey for Rufous-necked hornbills in Upper Siang district of Arunachal Pradesh. They wanted to assess the status of the hornbills’ population and the feasibility of a conservation programme in the area, so we were out to walk trails in the forest and to interview experienced hunters from the village. Towards the end of my time with them – having walked nearly 40 kms of forest paths – we’d gotten but a single momentary glimpse of one individual hornbill. It had called from the bare branches of a tree sticking out above the canopy. While its loud Kokk… Kokk… still resonated in our ears, it flew up a side valley and out of sight. Even without preliminary analysis, we could tell that the numbers in Siang were far less than the density estimate: one bird for every two square kilometres for community forests in eastern Arunachal Pradesh – to say nothing of the seven birds per square kilometre for protected areas like the Namdapha Tiger Reserve. Then in one of the villages we saw the head of a young female hornbill (in picture), killed a day-and-a-half’s walk away from the village. It still carried the smell of rotting meat. It was a sombre evening at the end of a tiring day, and we sat talking to the village gaon burahs (headmen) while the head dried in the smoke over the kitchen fire. It was surprising how little, for a hunting community, they seemed to know about the hornbill’s ecology. “They’re seasonal visitors,” we were sometimes told. But Rohit was convinced, given how good the forest is, that at some point there must’ve been sizable resident populations migrating locally, and our interviews confirmed this. The older men remembered times when the birds were more common and could be seen closer to the villages. “Yes, I guess we must do something,” they said. For over the last few generations, they’ve seen Malayan giant squirrels disappearing with the coming of air guns; porcupines, with the arrival of flashlights. We spoke to Anirban Datta-Roy of the Ashoka Trust for Research in Ecology and Environment, who worked in the Siang valley, studying the hunting and farming practices here. We discovered that there are indeed precedents of successful action against hunting. Take fishing, for instance. When blasting and rampant use of nets led to dwindling of the catch at the annual fishing ceremony – during which the whole village go out to fish together – a number of villages banned their use, restricting fishing to angling and the use of traditional traps. Hunting has been the way of life for the Adis of the Siang valley for as long as they can remember, though traditionally they hunted using traps and with bows and arrows. Their love for the forest clearly shows through. And nothing I had ever seen can match their love for meat. How else can you explain a wholehearted relish of dishes of smoked meat boiled with just salt? But what of the traditional knowledge that went with this love for the hunt? As encounters with the birds became rarer, it seemed that the birds had slowly lost their dignity in the minds of the hunters, their lore forgotten, their identity reduced to the amount of meat described by hands held apart in a circle, thumb to thumb, forefingers touching. Finally, an old man, his face wrinkled with age, who had never himself seen a hornbill nest, told us about the stories that his father had told him when he was a child about the birds’ elaborate courtship. The male woos the females with gifts of fruits, cajoling her to incarcerate herself into their nesting hole. Once she squeezes in, the female begins to close the mouth of the hole with her faeces – made sticky from eating figs – leaving only a small slit. Soon she lays two eggs, and the male then continues to feed her and the two chicks, bringing them hundreds of fruits every day, and the occasional treat of a poached fledgling, a hunted lizard or a squirrel that he’s managed to capture. The old man said: “They keep their nest-hole very clean, defecating out of the slit and throwing out any seeds that they regurgitate. There thus rises a dense growth of saplings under the nest tree. Yes, nodded Rohit, all this is well documented and studied at length for the Great and the Wreathed hornbill in other places in Arunachal Pradesh, the Western Ghats, as well as in Thailand. In about four months, the chicks are ready to leave the nest – four months, during which the male continues to forage for the family. Then, their labour of love finally done, the female will emerge from the nest, and slowly, over the next day or so, the parents will together coax the chicks to leave the nest. No animal can withstand that kind of hunting, where every young one as well as any breeding female, is taken. 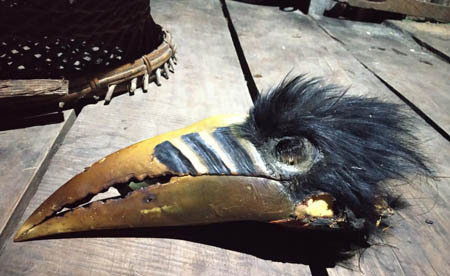 Hornbills are unusually vulnerable to hunting. Individuals in captivity have been known to survive to the age of 40, and they don’t start breeding until the age of three or four. Add to that the high mortality rates for hornbill chicks, with only one of the two surviving the first year, and picture becomes even more dismal. It is proof of thoughtful policies – and a matter of much pride for the Adi community – that they have access to one of the largest expanses of contiguous forest in the country. For once in history, the owners of the forest also have all the resources of the modern world at their disposal to come up with answers to certain fundamental questions about what it means to live sustainably and in harmony with nature.